Lasciate tutto appendere fuori e godetevi il vostro soggiorno in questo appartamento situato perfettamente con standard di costruzione superiori. A soli 200 metri dal lago - in prossimità di Nobelherberge Park Hotel Weggis - è il generoso appartamento 3 1/2 locali. Dalla grande terrazza si può godere di una splendida vista panoramica sul Lago di Lucerna. Il soggiorno / sala da pranzo pieno di luce con cucina moderna, ben attrezzata rende facile per voi, una volta di rimanere "a casa". Anche dalla camera da letto, si può vedere il lago. Uno spazio spogliatoio / ufficio con una postazione computer completa ha un secondo bagno. L'appartamento dispone di un parcheggio sotterraneo. E 'stato completamente rinnovato nella primavera del 2015 e ristrutturato. ich kann mich den anderen nur anschliessen. Die Aussicht traumhaft und die Ferienwohnung sehr gut. Amazingly appointed private home with a breathtaking view! Best vacation spot, EVER!!! We came to Switzerland for business in early March. There was still plenty of snow on the mountains and the weather temperature was brisk but refreshing. The home is located in a small town called Weggis. Because we were in the low winter season, still, there was literally nobody around. The streets were empty and it was almost like we had the whole town to ourselves. Weggis is quite small but it has everything you need within a bus ride or a walk. We had a car because we drove up from Geneva and were departing from Zurich. Either way, you really do not need a car to get to the major attractions from Weggis. The house itself is top notch with very nice high end furniture, decor, and appointments. The kitchen is very well equipped and well laid out. The bathrooms are both very clean and offer an option for a shower or bath. The best part of the home is the view from the patio and living room. 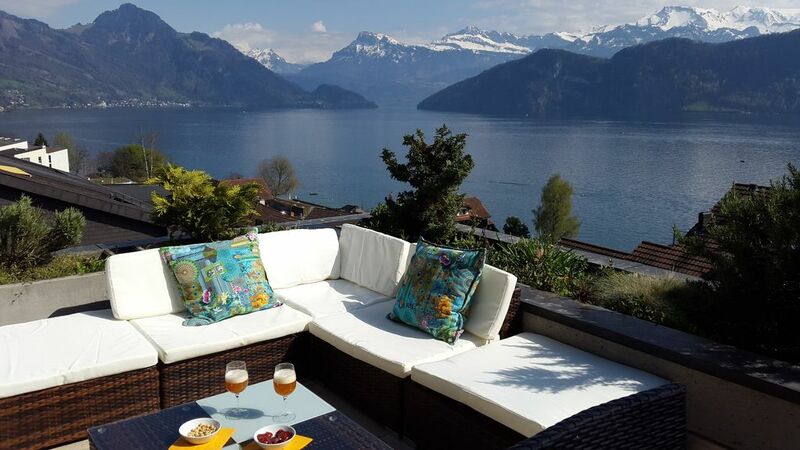 You pretty much have a 180+ degree unobstructed view of Lake Lucerne and the Alps. On a clear day, it's truly one of the most amazing and serene views. You can just sit out on the patio or gaze out the window, forever! Everything in Switzerland is clean and immaculate, including this house. Streets are litter free and the bathrooms are insanely clean and well stocked. The Swiss really seem to take pride in their country and keeping it clean. Even the drivers are super considerate and can actually drive! No honking or tailgating here! WIth Luzerne, a much larger tourist city, only a boat ride or bus ride away and Rigi Mountain, just a ride up the cable car, a 10 minute walk from the house, Weggis was the perfect location for us. We literally wanted to just relax, and lightly tour the surrounding areas of Luzern. Keep in mind Weggis is a very quaint town with a handful of hotels and restaurants all about 10 minute walk from the house, along the Lake. There are plenty of public transportation options, including a ferry that goes to neighboring ports where you can connect to trains, cable cars, and buses to almost anywhere. If you want to get off the grid, stay in an amazing home, in a quaint little hospitable town, this place is definitely for you! We were told it's quite crowded in the late spring and during the summer, typically occupied by local tourists, however during the winter, it's so quiet but still a perfect time to visit if you can time it like we did. Andrea, the owner, is super nice and easy to work with, also! Wir durften eine Woche in dieser schönen Ferienwohnung in der dritten Etage genießen . Der Blick von der Terrasse auf den See ist einzigartig. Die Wohnung ist modern und für den täglichen Bedarf, mitallem super eingerichtet. Zusätzlich befindet sich in der hauseigenen Tiefgarage ein sicherer Stellplatz für das Auto. Einen Aufzug für fussfaule, hat‘s natürlich auch. Die Kommunikation und der Ablauf mit der äußerst freundlichen Vermieterin, ist reibungslos und unkompliziert verlaufen. Ich/wir können diese Wohnung ohne Bedenken mit 5 Sterne prämieren. This was the best Homeaway property we have ever stayed in. We didn’t think any property could beat the cottage we had in Scotland, but this property did. We loved our 7 day stay in this apartment as well as the town of Weggis. My wife fell in love with the kitchen and the balcony and views are something else. There is an enclosed parking space that we used for our rental car. The property was spotless. We really hated to leave to come back to the States. Thanks Andrea. Weggis si trova nella zona turistica del lago di Lucerna Rigi. In barca si possono raggiungere Lucerna in 30 minuti. La funivia per il escursionismo e lo sci inizia nel Rigi villaggio stesso. Alcuni dei molti ristoranti sono pittoresco lago ed è raggiungibile da casa a piedi. Negozi e panificio sono ancora aperti la Domenica. Die Mietpreise basiert auf einer Belegung von 2 Personen. Für jede weitere Person wird eine zusätzliche Gebühr von Fr. 20.- pro Tag erhoben. Im Preis inbegriffen sind sämtliche Nebenkosten, sowie Bettwäsche, Hand- und Badetücher. Die Kurtaxen (im Winter pro Tag/Person 2.20, im Sommer pro Tag/Person 3.70) können zusammen mit den Endreinigungskosten (75.-) direkt vor Ort bezahlt werden. Die rückerstattbare Kaution beträgt CHF 400. Um die Buchung zu bestätigen muss eine Anzahlung von 30% des Mietpreises geleistet werden.